Choose from style "A" or style "B". STR2430A 24" x 30" x 33" style "A" tank rack, includes: 1 dunnage mat with frame. (1) 3-sided frame. (4) 33" posts. 1 cable assembly. Shipped knocked-down. Chrome-plated. STR2430B 24" x 30" x 74" style "B" tank rack, includes: 1 dunnage mat with frame. (1) 3-sided frame. (4) 74" posts. 1 cable assembly. 2 standard shelves. Shipped knocked-down. Chrome-plated. 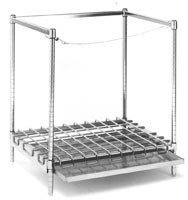 STR2448A 24" x 48" x 33" style "A" tank rack, includes: 1 dunnage mat with frame. (1) 3-sided frame. (4) 33" posts. 1 cable assembly. Shipped knocked-down. Chrome-plated. STR2448B 24" x 30" x 74" style "B" tank rack, includes: 1 dunnage mat with frame. (1) 3-sided frame. (4) 74" posts. 1 cable assembly. 2 standard shelves. Shipped knocked-down. Chrome-plated.